Traveling along the path of a labyrinth, the viewer passes through a series of extremely diverse landscapes, which are created through lush animation, evocative orchestral music, and rich dialog, in which words are used as much for rhythm and texture as they are for meaning. A man and woman guide us on this trip, taking us past gently falling Mondrian paintings, violent car crashes and bombing raids, and a pair of dancing, multicolored boxes, among many other settings. Based on an improvised performance, ‘Suggestive Gestures’ leads us gradually and indirectly towards a mysterious animal, hiding in the center of the maze.Director David Finkelstein characterizes his film as a ‘landscape.’ Words, images, and music are all used to evoke a series of changing textures and an evolving inner landscape, which the viewer is free to enjoy in the same way one enjoys a captivating view: by savoring the spatial and color relationships, and becoming immersed in the mood and emotional flavor of each scene, without necessarily expecting the experience to make statements or tell a story. The words, all improvised by Finkelstein and actress Cassie Terman, become physical objects in the scene, where they literally create the landscape and generate the volatile, changing moods of the piece. ‘Gertrude Stein was the first one to suggest that language could be used to create a landscape, rather than tell a story,’ says Finkelstein, ‘and her idea is still proving to be a fruitful way to make performances and films.’Despite the abstract nature of the film, many viewers will still see implicit meanings in the imagery. The image of the labyrinth and multiple references to the myth of the Minotaur call to mind the Jungian notion of the need we have to confront the monster within us, in order to embrace our whole nature and become free. Created and performed by David Finkelstein and Cassie Tunick, Music, editing, and visual design by David Finkelstein, 75 min. DAVID FINKELSTEIN was recently invited to perform and show his work at the Traverse Video festival in Toulouse, France. 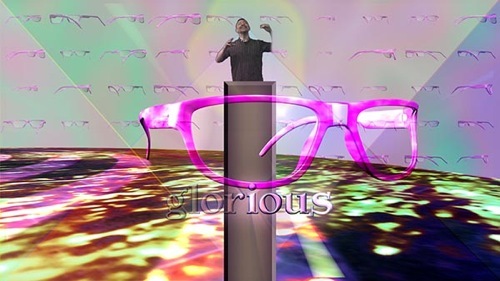 His video work has been featured in one man shows at Artist Television Access (San Francisco), CRS (New York), Robert Beck Memorial Cinema (New York), Echo Park Film Center and LA Filmforum (Los Angeles), Medicine Show (New York), MSU Moorheard, and with Ross Wilbanks at Light Factory and Pura Vida in North Carolina. His work has been screened in the Brainwash Film Festival, Traverse Video (France), Leeds International Festival (UK), Cinesonika (Canada), Experiments in Cinema, Les Instants Vidéo, Les Inattendus, Denver Underground Festival, Brick Theater, 1078 Gallery, Arthouse Festival, Outer Film Fest, Free Form Film Festival, Ybor Festival, Rubric Video, WRO (Poland) Festival, New Vision Cinema, Athens (Ohio) Film Fest, Dahlonega Film Festival, VideoBardo, Exground, Valleyfest, Big MiniDV Festival, Park City Film Music Festival, the Puget Sound Cinema Society, the Downstream Film Festival, the Silver Lake Festival, EXP2, New Filmmakers, Bearded Child Festival, X-Fest, SinCiné, and Gemini CollisionWorks. Altogether, his video works have won twelve awards at five different Festivals, including the Grand Festival Award from the Berkeley Video and Film Festival for “Born in Mid-Flight” and “Best of Festival: Experimental” from the Brooklyn Arts Council Film Festival for “Earth and Moon in Love.” He has been commissioned three times to create videos for the Outmusic Awards, and these videos were subsequently shown on the PrideVision cable network and the PBS series “Under the Pink Carpet.” His work has been funded by The Fund for Creative Communities, The Field, Movement Research, Meet the Composer, The Brooklyn Arts Exchange, BACA, and other sources. This entry was written by Claire Bain, posted on September 22, 2014 at 9:33 pm, filed under blog. Bookmark the permalink. Follow any comments here with the RSS feed for this post. Trackbacks are closed, but you can post a comment.